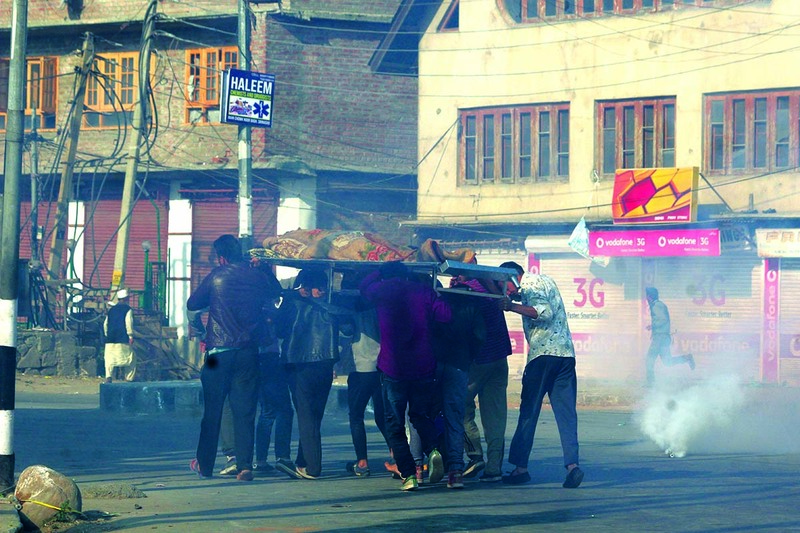 Mourners carry the body of the slain civilian Mohammad Saleem Malik amidst tear gas shelling. Boycott has remained a key player in Kashmir’s democratic history. Since the popular political forces have stayed away from the electoral exercises for one or the other reason, these boycotts have helped the people living on the margins of the overall political space to get noticed and even get power. The practice has been standardised by the state that uses boycott as an instrument of blackmail. “In 1996, the National Conference (NC) boycotted the Lok Sabha polls and was seeking some political concessions,” said, one party insider, who has switched sides however. “When the elections threw up new faces and one of them eventually became the Minister of State for Home in Delhi, it impacted the party from within. Later, the party decided to contest and it was without a condition.” The 1996 assembly elections eventually led to the return of Dr Farooq Abdullah to power with a historic mandate. That is exactly getting repeated now. Individuals who were on the margins of politics or were merely aspiring to join politics have joined the municipal and Panchayat bandwagon. In absence of any real contest on one side and lack of better participation, they will make it to the power corridors at the grass root level. Getting power has remained basic to the politics, off late. In Kashmir, power has come first and legitimacy later. 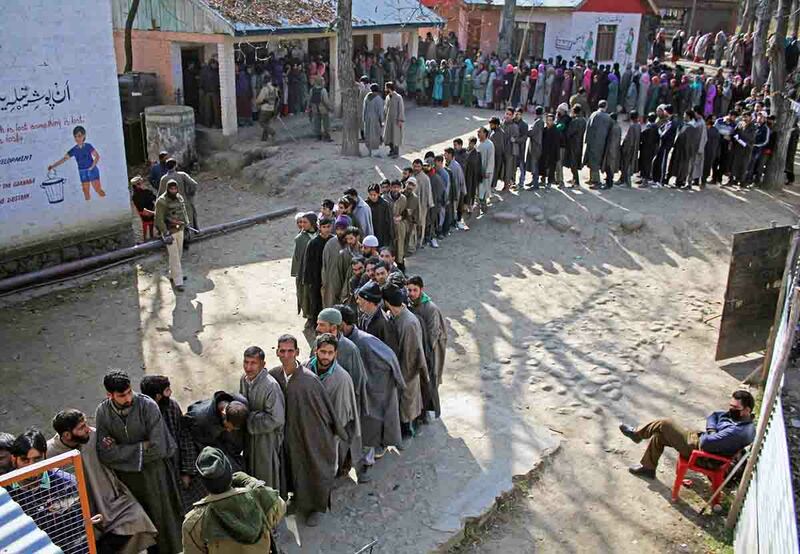 In the first two phases, 336 wards will go to polls across Kashmir. For these wards, 631 nominations have come and accepted after scrutiny. “For 80 wards, no nomination has come,” an insider said. “In about 100 wards or more, there is just one nomination each which means they stand elected uncontested.” Going by the scale, one officer said, half of the exercise is already over in the two phases as results of fifty per cent of wards have come out at the nomination stage alone. In the first of the four phases for the urban local bodies, Kulgam and Anantnag (Islamabad) have 53 municipal wards. The total number of candidates whose nominations were found valid is only 50. In 11 of these wards, not a single nomination was received. In many wards, there is just one contestant who has already been declared a winner. Individuals apart, this time, the focus seems to be on families. BJP has worked overtime to motivate families to get into the fray. In one south Kashmir belt, father, mother, daughter and the son filed their nominations from different wards. Unfortunately, the son was found underage and his form was rejected leaving the remaining three family members in the fray. There are possibilities of some municipalities to be managed by the families only. In Baramulla, a young man took his mother and brother to the Deputy Commissioner’s office and got the forms. They are hopeful of the victory because neither the National Conference (NC) nor the Peoples Democratic Party (PDP) is around. It is BJP and Congress which are pan-India parties. The government has taken care of the concerns of the people willing to play the ball. Chief Secretary B V R Subramanyam said they have 300 hotel rooms in Srinagar for their security and the government will be offering the candidates vehicles for the campaigns if they wish so. Already, political sources suggest, the government has withdrawn as many as 30 vehicles from the political class – NC and PDP, possibly to accommodate the concerns of the emerging political class. The government has extended a life insurance cover of Rs 10 lakh per head to the participants. Those who will eventually hold offices in ULBs and the Panchayats will have access to a lot of funds. Subramaniyam said Jammu and Kashmir has lost Rs 4300 crore from the award of the Fourteenth Finance Commission for the lack of these grassroots level institutions. The next award will offer more funds and a Panchayat can have more than Rs 40 lakh available with a right to tax and create its own revenue, he added. Kashmir has its political class vertically split on the ideological basis. Separatists have remained disengaged from all the formal governmental processes (read engagement) for a long time because unlike Congress, it suits BJP. Now the two main unionist parties are also disengaged and side-stepped. This marks either the end of politics or the re-emergence of a new political class, at least for a strong state set-up like Jammu and Kashmir. The route to boycott was intelligently traced by the NC. After Narinder Nath Vohra expressively conveyed the central government that the trial on Article 35(A) should be left to an elected government, he and his successor Satya Pal Malik’s administration started using the same plea for deferment before the Supreme Court. The plea was that since the state was scheduled to go for local body polls, the hearing would impact the situation. Since the central government has remained non-committal in the courtroom on the issue, despite a notice by the court, the NC said that the government has been linking the polls with the Article 35(A) which is crucial to the Kashmir identity. PDP had no exit routes but was happy to follow the suit. CPI (M) also jumped the bandwagon. “Article 35(A) is very important and crucial because it is a constitutional guarantee,” Tarigami said. “The other factor is that how Kashmir was handled in last few years and if all the political parties and the people are so much concerned on Article 35(A), why Government of India is not addressing this mass concern.” Tarigami said the governor as the absolute ruler of the state of Jammu and Kashmir cannot have the alibi of saying the elected government will take a call on Article 35(A). Congress said it cannot afford to offer a cakewalk to the BJP in the polls so it will contest. But Kashmir is not Jammu and Kashmir. In Jammu and Ladakh, the polls have triggered a huge exercise. 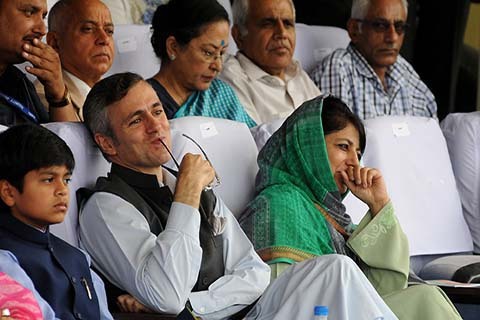 BJP general secretary Ram Madhav alleged the NC and PDP have fielded proxy candidates. NC says it expelled almost seven of its members for participating in these polls in Jammu, where the exercise is incident and tension free. PDP says it is willing to act against any member who violates the party whip. The fact is that these parties are out in the race. Both the parties have permitted their members to contest independently. “It is unofficial but it is true,” M S Nazki said from Poonch. “There is not much of enthusiasm in Mendhar but in Poonch and Surankote, people are excited. Both the parties have fielded their candidates in individual capacities.” An NC leader from the area said the participation in elections will be low. “Our party has stayed away and has not asked people to boycott,” he said. “Had it been done, it would have been an abysmally low participation.” The leader alleged that the Congress and BJP have opened the deep pockets, especially the latter. 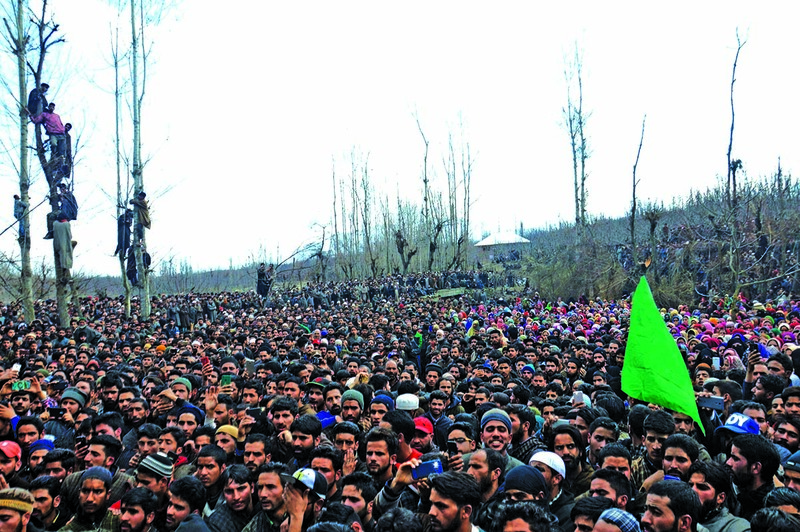 People taking part in a local militant’s funeral. But the NC and PDP absence has devoured the ‘credibility’ from the exercise, at least in Kashmir, an area that matters most in Jammu and Kashmir. This was despite the fact that neither of the two parties, while staying away from the exercise, attempted to move around and use the space to converse with the masses, explaining to them why they stayed away and what they stand for? “After we kept Geelani Sahib and his colleagues restricted to their homes, the political space was taken over by Reyaz Naikoo,” Parra said. “Now, tell me, if there are 30,000 people waiting to see a glimpse of Naikoo at the funerals, how we can say he is a terrorist. He is a leader who speaks, communicates with the people and his audience is not rented mobs, they are committed to his politics.” He believes the militant funerals are “political rallies” where “sacrifices” are celebrated. On the hindsight, certain elements in the ‘mainstream’ are not so unhappy over the “loss” that the exercise will make them pay for. “We witnessed shrinkage of space and the new dispensation will create the space for us,” one political insider from one of the two parties said. “After people will come to know the people who will be holding office for five years with more than Rs 4000 crore in their coffers, it will trigger a reaction, rather a chain reaction and that is where the NC and PDP will return to some sort of relevance.” In a way, they think, the new grassroots dispensation will emerge the mainstream’s new firewall. The government has already managed a reinforcement of more than 40,000 paramilitary men who would stay in the state till the Panchayats are elected. After Dilbagh Singh succeeded SP Vaid as the state police chief, the security drill is witnessing certain shifts on the ground. The electoral office is not leaving anything to chances. Sensitive areas will witness ULB polls in a way as if they are in cordon and search operations (CASO). Srinagar city will complete the polls for the Srinagar Municipal Corporation (SMC) in four phases: 3 wards on October 8, 20 wards on October 10, 26 wards on October 13 and balance 25 wards on October 16. Politics apart, the situation is a real worry. Militants have already issued threats asking the government to send funeral shrouds along with the polling material. The situation is south Kashmir is pretty explosive. Efforts made on ground level so far have not impacted the surging sizes of the militant funerals, considered to be a key in sustaining the overwhelming situation. Subramaniyam told media last week that there are “pockets” where security is the concern. But the security problem, he said, is restricted to “only certain areas in South Kashmir” as in north and central Kashmir situation is not worrying. He did talk about the enthusiasm that Jammu is exhibiting while readying for the polls. Jammu Municipal Corporation (JMC) has got as many as 476 forms – 141 of them female, and the real contest is between the Congress and the BJP. Indications suggest that BJP will get the JMC leadership. But the question that everybody on Srinagar streets is asking is why all this is happening? Why elections are so vital at a time when Kashmir is in the midst of a serious turmoil? Unlike south and north of Kashmir, the centre was tense but was somehow spared from the civilian bloodletting. This marked an end last week when a young man was shot dead in cold blood during the dead of the night. The grim pictures that emerged after the murder were a dismal commentary on the situation prevailing in Kashmir: female relatives of the slain were pleading the policemen to permit mourners to join the funeral. Later that day, eighteen injured were admitted to various hospitals in Srinagar, with most of them with eye injuries. BJP, in the last more than five years, has created a new model of social engineering. Utter Pradesh displayed its significance where the party managed entire Hindu vote to make the otherwise 14 per cent “kingmakers” irrelevant. They said the Muslims were the ‘surplus vote’. The scheme fits in the larger context. In 1963-66, when Sheikh Mohammad Abdullah was in jail and Ghulam Mohammad Sadiq brought Congress to Kashmir, a mass social boycott was launched against the party. “Divorces took place for political reasons and the coffins were denied to the dead Congress workers,” Malik said. “There was intense hatred and gradually it reached a level that 11 years later, Sheikh Sahab headed a Congress House.” BJP is following the same plan and the ongoing ULB/Panchayat polls are the foundation stones for that. This is the doctrine on which BJP is apparently working. Is it?